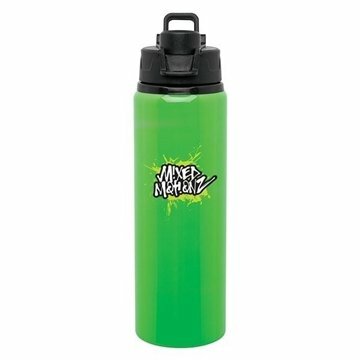 If you need a unique water bottle you can't go wrong with the 28 oz h2go Surge water bottle! Made top of the line aluminum, you'll be hard pressed to find higher quality than this! With it's sleek design and unique lid perfect for attaching to bags and clips, you'll wow your customers and employees with this item! The 24 oz h2g0 Surge water bottle can be customized with your logo in not only single and multi-sided Screen Printing but also with a full wrap as well! Comes in a brilliant neon green color with threaded flip-up straw lid. A really nice method to thank our clients. I will purchase more, we are running out quite fast. I like the product,overall the quality is good. I like the functionality and practicality of this which added more value to an already very affordable price. Everybody loved them. They are durable and convenient to carry. The best product we have used. the sales people at AnyPromo answered all our queries and allayed all our concerns. We handed them out in a recent tradeshow and they were popular!